Baby Nate was born on the 31/5/2013 in London, United Kingdom, the first child in the family. There was no family history of any foot abnormalities, but, on his 20 week antenatal scan, he was diagnosed with bilateral clubfoot. At this point Nate’s parents were seen by the paediatric orthopaedic team for a discussion about clubfoot and the treatment available. 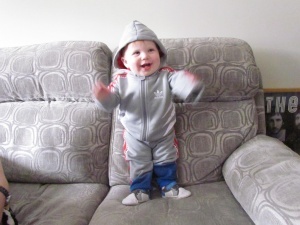 Nate’s parents initial reactions to his diagnosis were ‘fear, panic and worry’, but after receiving information about the Ponseti treatment and meeting the clinicians who would be treating his feet they were able to feel prepared for what was to come. Nate first attended the clubfoot clinic with his parents when he was just under 2 weeks of age. The diagnosis of bilateral clubfoot was confirmed, with a Pirani score of 5.5 in both feet. His upper limbs, spine and lower limbs were checked for any other issues and there was no other abnormality detected. Ponseti treatment was started the same day, after a discussion between the clinician and parents, giving them an explanation of the treatment and a chance to ask any questions. Nate was treated using the Ponseti technique at Chelsea and Westminster Hospital, London, UK. He had 6 casts over a period of 4 weeks in order to achieve initial correction of the feet. The manipulation and casting was performed by specialist physiotherapists in the Ponseti clinic. First cast: the first ray is elevated to bring it into line with the hindfoot. After the 6th cast is removed the Pirani score is 0.5. The feet are fully abducted to 50 degrees, but cannot be dorsiflexed past neutral. An Achilles tendon tenotomy is therefore needed. A topical anaesthetic cream is applied to the tenotomy site and left in position for 30 minutes to take effect. The tenotomy is performed by an orthopaedic surgeon in the outpatient clinic with the baby’s parents present. As the tenotomy is performed the assisting physiotherapist holds the foot firmly in maximal dorsiflexion. A palpable ‘pop’ or release sensation can be felt as the tendon is cut, indicating that it is completely divided. After the tenotomy is completed pressure is put over the site for 5 minutes, until the bleeding stops, with the foot held continually in maximal range of dorsiflexion. A final cast is then applied with the foot in maximum dorsiflexion and abduction This remains in place for 2.5 weeks while the tendon heals. 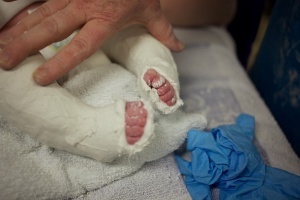 When the casts were removed after tenotomy, the Pirani score in both of Nate’s feet was 0. There was now around 10 degrees of dorsiflexion, and the heel was in neutral. Nate at the Chelsea & Westminster Hospital Ponseti clinic - first fitting of boots and bars. Virtually no scar at all from the tenotomy. A foot abduction brace was fitted with both feet set at 60 degrees of abduction and 10 degrees dorsiflexion. Nate wore the brace for 23 hours out of 24 for the first 12 weeks, and then his parents reduced brace wear down to night and nap times. He attended the clubfoot clinic regularly for checks and so the brace could be adjusted. His parents continued to apply the brace every time he went to sleep. Nate expects to be given the all clear to finish using the brace in a few months time. ‘I remember Nate’s dad asking me the evening before he came to the end of his 3 months 23 hours a day boots and bars period whether I was excited it had finished. I answered that what i was most looking forward to was people not staring at him. I'd never experienced that before and opened my eyes to the issues those with real disabilities must face. Very few people actually engaged me in conversation to ask why he was wearing them, they tended to joke about him being in an accident, which is not what you want to hear,especially as a first time mum!! After the initial corrective stage of treatment all parts of the CAVE deformity had been eliminated, the Pirani score was 0, and Nate’s feet could be passively moved to 60 degrees of abduction and 10 degrees of dorsiflexion. At 14 months of age, Nate was able to walk holding on to furniture. His Pirani score was 0, he had more than 20 degrees of passive dorsiflexion and his everter muscles were starting to work well. At 4 years of age, Nate has nearly finished his time in the Foot Abduction Brace. He is able to participate fully in activities of daily life alongside his peers. At four years of age, a Roye score was completed by Nate’s mother. This score measures the parent’s or patient’s perception of their foot function and appearance. Nate scored 96.67/100 – with 100 being best function. The only area that he did not score 100% for was for finding ‘shoes that fit’, for which Nate’s mother reported sometimes having difficulty.